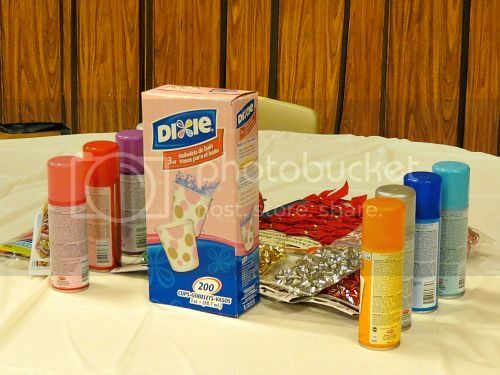 Frugal and Thankful: First Christmas party - done! First Christmas party - done! 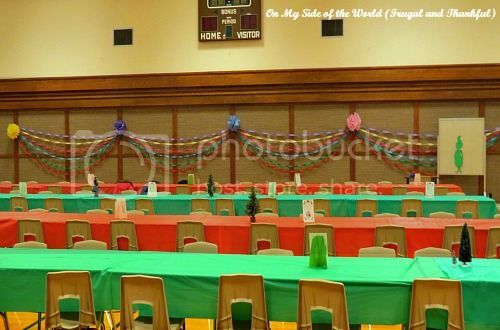 For the past three days I have been busy helping with our Church Christmas party. It might've just been the most anticipated party of the season because we found out that we would be some of the organizers only three weeks ago. Yikes! I've never helped to throw a get together for more than 200 people before, especially in such a short time span. We decided to go with a Grinch theme. Unfortunately, our "Grinch" bailed on us at the last minute... But it still turned out OK. I wanted to share with you a few pictures but for the privacy of the participants, they were taken before the party. We didn't go completely with traditional seasonal colors because, after all, Whoville is a fun place to live in, right? :) It looks simple but, believe me, it took us quite a few hours to pull it all together (considering there were only four of us organizers). The kids were "pinning" hearts on it. It was a lot of fun! I used bags of seasonal M&M's for these treats. And don't ask how many hours it took me to separate the greens from the reds. You don't wanna know:) I wanted to buy just solid green from a specialty store but they were $8.99 a pound! My frugal heart just couldn't do it. With shopping sales I got these bags for half the price, and that's if you don't even count red ones which were actually an awesome addition to the cocoa bar. We had a lot of fun but I also think that this party was a great example of frugal lifestyle. You don't have to spend a lot of money to have fun and enjoy yourselves! The decoration od the hall looks great. Are they paper chains? Brilliant Gringe. The party bag was a great idea. Well done to the four of you It sound like it was a lot of fun and the kids enjoyed them selves and I expect you organisers did too. Thank you, Carol! These are actually $ store curled streamers. It's a simple way to decorate but they look great! I know it was a lot of work. So happy you spirits were lifted in the work. Looks like a lot of fun. It must have been a great sense of satisfaction after it was over and went off really well. We're still focused on our renos around here so haven't got too much Christmas spirit yet :( At school though we are having an Advent countdown and did our room decorating last week. It seems that I get more into the spirit when I'm around children. As adults we lose a bit of that excited feeling, but kids never do! Hope everyone is on the mend at your place Lena! Everything looks great particularly the green candy! That looks so much fun! 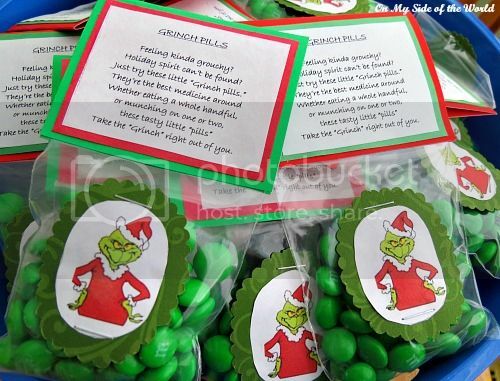 Love the grinch you drew and that is such a cute party favor! I am sure everyone had a blast! Now you gave me some ideas for our school party :) Hope everyone is doing better at your house. I'm glad you fond it useful! :) It was a lot of fun! I'm curious why is was not supposed to be a religious party but a social gathering? 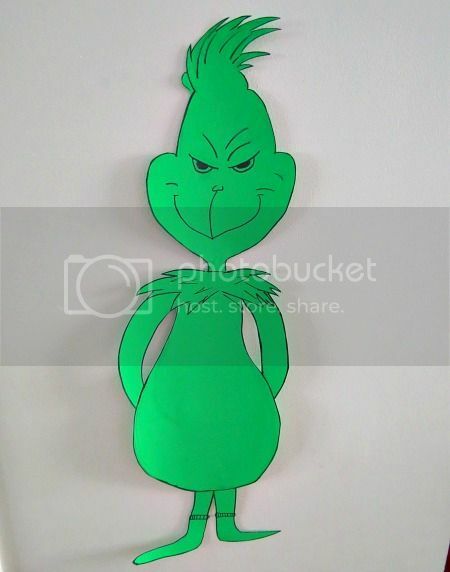 I think your grinch looks great! Glad everything went well. Sounds like a really fun, well organized activity. Way to go! Great job! You're so creative.